A professor, a comedian, and an artist break down their interpretation “race card." What exactly does it mean to play a “race card?” Explore this question from unique and differing points of view. Professor Derald Wing Sue analyzes race and gender based microaggressions. Oh, You’re Going to Pull the Race Card? What do you hear when people use the phrase "race card?" What kinds of microaggressions have you ever witnessed, if at all? Use the hashtag #WhatIHearPBS to share your thoughts. 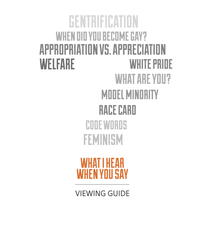 Dig deeper into the conversation with a detailed Viewing Guide: What I Hear When You Say: Race Card.